Thanks to its Special Economic Zone status, many foreign companies assemble cars and electronics in the Kaliningrad region for the broader Russian market. But corruption remains a major barrier. At public events on corruption, no matter how sophisticated the participants and no matter how narrow the subject, the discussion invariably seems to wander off topic. Often the audience members want to speak about a high-profile case like the suburban Washington, DC, politician’s wife who stuffed $79,000 into her undergarments when federal agents came knocking. Sometimes, speakers wander off into digressions on how one nation or another is inherently corrupt because of cultural and historical factors. Frequently, attendees simply conflate different kinds of corruption – petty, political, commercial – into in insoluble morass. This was the case at a recent CIPE-supported event held in November in Kazan, Russia. One of the 70 participants began to derail a technical discussion of Russian legislation with a series of questions about recent arrests of regional political leaders on bribery charges. Some of the audience perked up. Others looked uncomfortable, not expecting this at a conference on how to boost investment by improving firm-level compliance with anti-corruption laws. Igor Belikov, the event’s moderator and head of the Russian Institute of Directors, deftly reined in the discussion and with a bit of humor brought it back to the subject at hand – how mid-sized firms can reap the benefits of globalization by putting in place anti-corruption compliance programs that give the firms better access to multi-national companies’ global value chains. One of the benefits of this approach to reducing corruption is that it is simple and narrow. It is aimed only at the private sector. Its principle rationale is not ethical but economic: a firm that does not engage in corrupt practices is more likely to find business partners than a firm that does nothing to combat corruption. Maintaining this simple, narrow focus helps CIPE to avoid some of the pitfalls which can befall other anti-corruption efforts, which are sometimes co-opted by people with partisan political agendas or stymied by those who benefit from the status quo. This approach is just being launched in Russia but has already enjoyed success in Thailand in a somewhat different form, as detailed in this blog post by John Morrell. Morrell spoke in Kazan, describing how the CIPE-supported initiative has developed in Thailand to the point where it is a major force in stemming corrupt practices. The Thai initiative is a textbook example of how businesses can act collectively to combat corruption, an approach outlined by Morrell and CIPE Knowledge Manager Kim Bettcher in a recent Feature Service article. 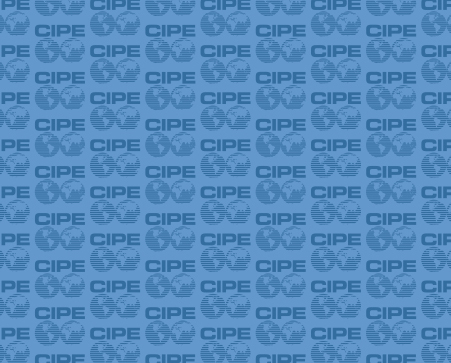 Moving forward, in Russia and perhaps other countries, CIPE is likely to pursue this specific anti-corruption approach in a variety of ways adapted to local markets but always rooted in a basic premise. Entrepreneurs can only grow into global value chains if they take steps to stop their own firm-level corruption. Frank Brown is Program Officer for Eurasia at CIPE.